Looking for inspiration? Peruse the images above for guidance. Or, simply leave the decision with us so you can get on with your day! Remember, we choose market-fresh blooms daily to create beauty and send good energy and as much as we love every flower on these pages, occasionally some will be held back from our studio by us or by Mother Nature herself. On those days, we'll create using choice blooms based on our expertise. Oh! And do let us know if you have specific preferences or avoidances. Imagine. You are in hot water up to your knees. Or over your head in love! You need "effect" and you need it fast. 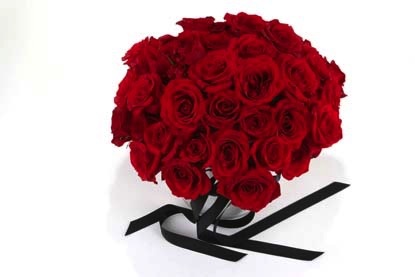 A Shock and Awe arrangement from Blossoms Rosedale delivers! Rush delivery makes it even more effective. Known as mono botanical, designs like these render in tints tones and shades for visual richness. From $175 (shown $275). 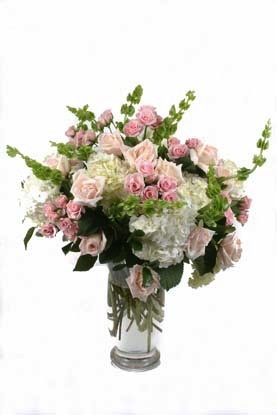 Shock and honour her with pale pink roses and cream roses, white hydrangea, and bells of Ireland in a see-through cylinder from $200 (shown $300). 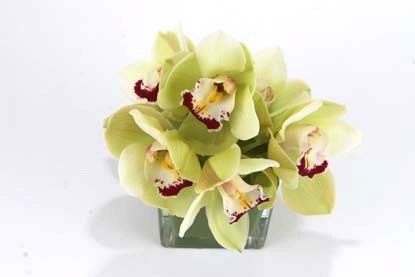 Send the simplicity of a cascading cube of apple green cymbidium orchids ($95 as shown).